DIRECTIONS: I-95 to exit 80 (Lakeside Ave.), bear to right at light - go through 2 lights, the entrance is on left just past 2nd stop light - Lakeside & Hilliard. GENERAL DESCRIPTION: Lewis Ginter Botanical Garden offers year-round beauty with more than 40 acres of spectacular gardens and the mid-Atlantic's only classically styled Conservatory open to the public. Great shopping and dining plus a new Children's Garden with a Tree House make the Garden a fun place to visit anytime. Come see why Lewis Ginter is the place where plants-and people-grow! The Garden offers extensive plant and tree collections and changing displays of seasonal flowers, and hosts educational programs and special events year-round. The universally accessible design of the Children’s Garden, including a tree house (13 feet above ground) and ramp that can be “climbed” by adults and children, ensures that visitors with disabilities can participate in a full experience of this garden. Wheelchair-accessible tree house, on the edge of the Garden's lake with dramatic views of the Conservatory, the Rose Belvedere and all the elements of the botanically rich Children’s Garden. PARKING: 16 wheelchair accessible parking spaces near entrance. Ramp well marked, cannot be blocked by another vehicle. RV parking. Accessible parking spaces are available in all parking lots. The accessible spaces closest to the Robins Visitors Center are on the group entrance side of the building. TYPES OF PATHS TO OR AROUND ATTRACTION: Brick, aggregate or sealed concrete, paving stone, asphalt and one mulched path. Most paths accessible to persons with mobility disabilities. Paths are long - benches along the way. ENTRANCE: No steps. Wheelchair accessible sidewalks. The Robins Visitors Center has automatic doors at the main and group entrances. PUBLIC REST ROOMS: Located Robins Visitors Center, Education and Library Complex, Robins Tea House, Conservatory, Children’s Garden, Bloemendaal House. Doors open out. Turns to enter. Accessible stalls have doors opening out, and handrails. 19 in. toilet seat. Accessible stall checked regularly for obstructions. Restrooms are identified by a raised figure with pants or skirt on door to designate men or women. For guests with mobility disabilities, a limited number of wheelchairs are available in the Robins Visitors Center on a first-come, first served basis. 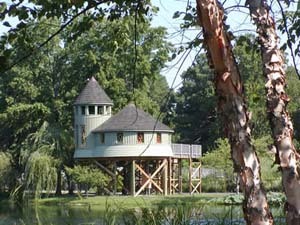 There is a wheelchair-accessible CWDKids Treehouse. Link to audio tour of the individual gardens. FOOD AND BEVERAGE FACILITIES: Located at Lora & Claiborne Robins Tea House and Garden Cafe in Visitors Center. Facilities most accessible to wheelchairs located closer to entrance. Lunch served 11 – 3. GIFT SHOP: Aisles 5 ft. wide. Counters 38 in. high. Aisles clear of temporary displays. ADDITIONAL INFORMATION: Admission fee. Hours: Gardens and Robins Visitors Center 9-5 daily. Garden Shop 10-5 Mon-Sat, 12-5 Sun. Garden Cafe 10-4 daily. Robins Tea House 11:30-2:30 daily. Closed on Thanksgiving Day, Dec. 24 and Dec. 25. Link to map of the gardens.